Toyota’s Multi-Mode transmission (MMT) has been around for over seven years and is commonly fitted to the Aygo, Yaris and Corolla models. You will find it being referred to as an ‘automatic’, which it is, but it shouldn’t be confused with traditional automatic transmissions. Traditional automatics provide smooth driving characteristics, due to a transmission equipped with epicyclical gears, hydraulic clutches and a torque converter; the MMT has none of these features. The MMT is an attempt to provide a small, efficient automatic transmission with all the energy-sapping complexity of the previously mentioned hydramatic derivatives. In effect, it is a conventional five-speed countershaft gearbox with a robot employed to do all the shifting and clutch work. This all sounds fairly simple, but it’s only when we consider how a driver controls the clutch and the gearbox that we begin to appreciate how complicated the whole process is. This system uses permanent magnet motors to control the clutch and gears. There are three actuators; the shift and select actuators (Fig 1 below), which move the selector rod in the same way as the “H” movement of a manual gearbox. The clutch actuator (Fig 2 below), which moves the clutch pushrod. The motor’s torque, speed and direction are monitored and controlled by Pulse Width Modulation (PWM) and polarity. Hall sensors feed back to the transmission control module to inform it of the speed and position of the actuators. The purpose is to stimulate a driver’s use of the clutch and gears, thus, prevent misuse. Think about the degree of control required to drive a vehicle onto a ramp. The driver has to sense forwards or backwards movement, acceleration, the clutch biting point and engine speed etc. For the Transmission Control Module (TCM) to do this, it requires information from various sensors. The TCM needs to know the speed of the vehicle, the direction of travel and to be able to pick up the smallest movements. As traditional ‘reluctor’ type sensors can’t do this MMTequipped vehicles are fitted with Magnetic Resistance Element (MRE) digital sensors which have the advantage of providing a signal from rest. The sensor detects movement, speed and direction. The wheel speed sensors are part of the ABS/VSC system which gather the information and pass it to the TCM. Comparing the speeds from these sensors allows the TCM to calculate clutch slip and “learn” the clutch biting point. For all this information to come together there has to be communication between the engine, transmission and brake control modules. This is done by a combination of a hard wired connection between the brake module and TCM and a CAN BUS network between the Engine Control Module and TCM. CAN communication allows the TCM system to communicate with and control systems in other areas of the network. The system is programmed to monitor and ‘learn’ operational changes. The TCM actuates the clutch and measures the end-to-end travel. The clutch biting point is monitored on actuation to account for centre plate wear. This is monitored to account for wear in the selectors and the baulk rings in the synchromesh. It also allows for a strategy to re-attempt a gear selection if gear baulking occurs at the first attempt. This is a two pedal operation system so there is no clutch pedal and there are two modes: Automatic (E) and Manual. On some models manual shift controls are replicated on the steering wheel. A shift lock solenoid is incorporated into the selector and the foot brake must be applied to release it. In E mode, (which is the equivalent to a fully automatic ‘D’ mode) the TCM calculates when to change gears, taking into account the driving conditions and the driver’s driving style. Up-shifting can take place with the accelerator fully depressed; the ECM takes control of the throttle. Hard acceleration produces a kick down effect by advancing the down change time while deceleration causes the system to select the most appropriate gear for engine braking. The clutch also disengages as the vehicle slows to a halt to prevent the engine stalling. In Manual mode the driver decides when to change gear using the gearstick. The TCM then automatically operates the gear shifting mechanism and the clutch, however the transmission will automatically change down a gear to prevent the engine laboring or change up a gear to prevent engine over-revving. When the brake pedal is not depressed and 1st, 2nd or reverse is selected, the clutch is half-engaged, even if the accelerator pedal is not depressed. As a result, the vehicle can creep slowly like an automatic transmission vehicle; this will assist the vehicle in preparing to move. The take off assist control is cancelled while the parking brake switch is ON. There is no ‘P’ (Park) function, but it is possible to stop the engine with a gear engaged (to park on a slope for instance). When this happens, the driver needs to press the brake to allow the engine to be restarted. This is built into the gear selector mechanism. 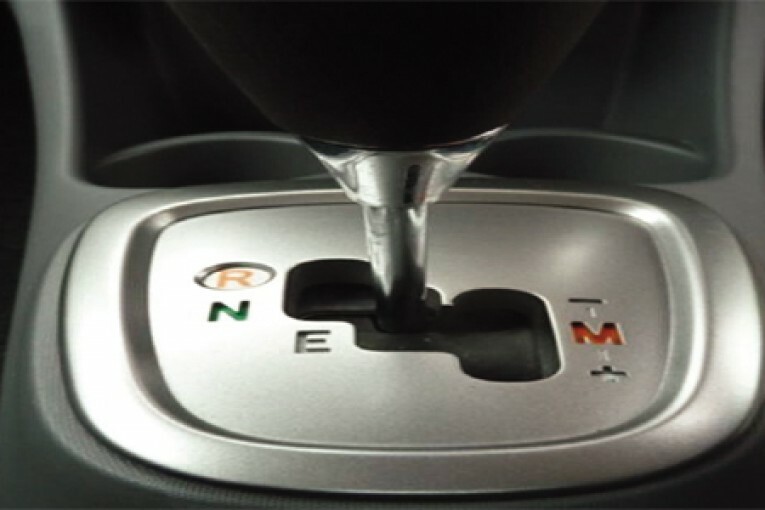 If the shift lever is kept in the ‘N’ position for two seconds with the brake pedal released, and the vehicle at rest, the transmission control ECU locks the shift lever to prevent improper shift lever operation. The shift lever is unlocked when the brake pedal is depressed. A self adjusting clutch mechanism is fitted to the cover plate. This reduces the need for large clutch actuator travel to account for wear on the centre plate and is a simple ratchet and pawl device. Firstly remember that this is a conventional 5 speed gearbox and that all the problems associated with such a device can occur on the MMT. Should the car break down it may do so with a gear engaged. By carefully removing the select and shift sensors (Fig 3 below), the slotted ends of the shafts are exposed; neutral can be selected by turning the shafts. With so many sensors and actuators involved, a whole set of parameters are generated. Obviously you will need a scan tool that will allow you to access the Digital Trouble Codes (DTCs), data and perform actuations to assess the performance of the system. The G-scan tool from Blue Print allows full access to the system to diagnose problems associated with the control system. Gear selection can be actuated and data monitored at the same time to aid diagnosis. Under normal conditions, with the clutch engaged and the transmission in neutral, the clutch is slightly preloaded. Consequently when replacing the clutch, or clutch actuator, the clutch must be put into a default position with the load removed or damage will occur. This is known as the clamp position and can be done with the G-scan or manually, using our new MMT technical bulletin (this can be accessed www.blue-print.com/mmt). When any of the actuators, sensors, clutch components transmission assembly or TCM are replaced, the system must be initialised. Initialisation removes all learned values from the TCM memory and relearns the clutch biting point and selector mechanism movement. This too can be done with the Gscan, or manually using the MMT technical bulletin (removing the battery negative will not erase the TCM memory). When the vehicle is started and drive is engaged the vehicle should creep forward – this confirms the initialisation has been successful. This sounds very complicated but is in fact just a test drive. It allows the system to fine tune the clutch actuation and gear changing. This will happen naturally in the hands of your customer, but in order to hand the vehicle back in optimum condition, follow the procedure shown in the aforementioned MMT technical bulletin.